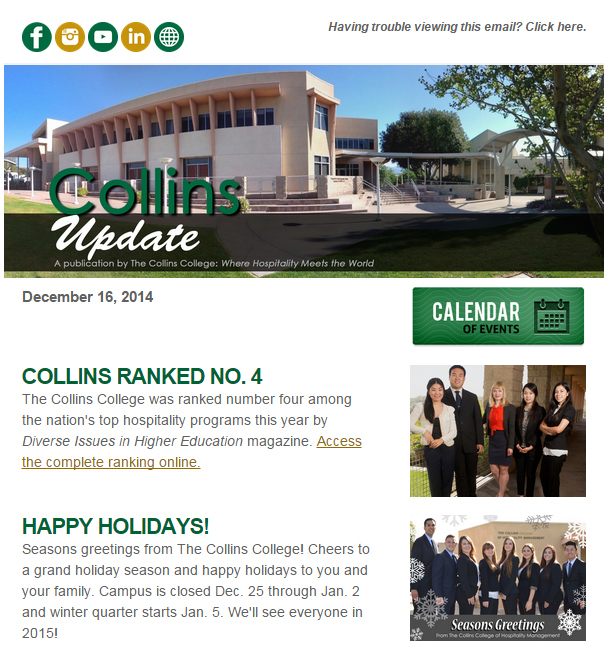 The Collins College Update is a weekly or as-needed e-newsletter about activities and other news at The Collins College of Hospitality Management. All Collins College faculty, staff and students receive this newsletter in their csupomona.edu inbox. Additionally, the college's Board of Advisors, on-campus partners and the Collins Hospitality Society board, receive the publication. If you would like to submit an item for The Collins College Update or be added to the distribution list, please contact Diana Garcia, Communications & External Relations Specialist at (909) 869-3151 or degarcia@cpp.edu.